Houlder will further cement its position in the LNG Storage and Distribution market by exhibiting at Gastech 2018, September 17-20. Over 30,000 international professionals from a vast array of industries across the natural gas, LNG and energy value chains will be attending the event to meet and do business. Houlder’s Stand (F107) will feature a range of LNG Bunkering and Transfer products and services including the KHOBRA Transfer System, developed with KLAW LNG, and a ‘jettyless’ Floating Transfer System. With LNG demand set to grow by around 50% over the next twenty years, innovative cost-effective infrastructure is only going to increase in value and importance. Houlder, together with other GasTech 2018 exhibitors, are fulfilling some of the most intriguing technical challenges in our industry. The KOHBRA system (below) provides a safe and efficient hybrid hose handling solution for small to mid-scale LNG applications. 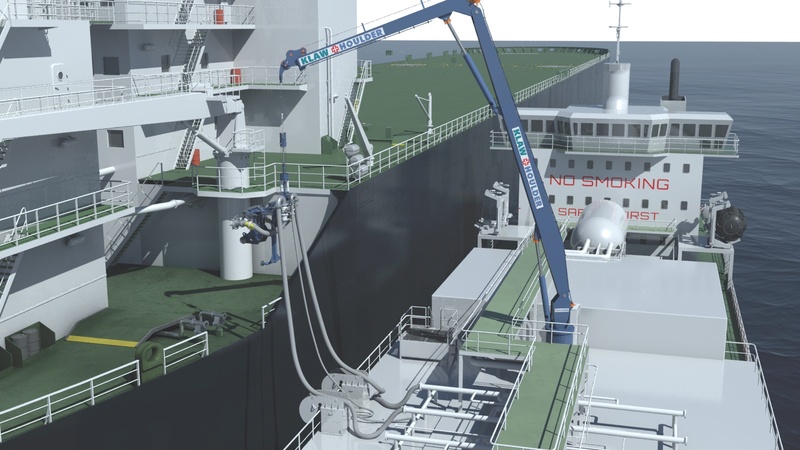 Simpler, quicker to operate and safer than current hose operations, the transfer system utilises a standard ship crane to deploy a manifold connection and emergency release system to the receiving vessel. It has been designed to provide small to mid-scale LNG operators with a cost-effective solution to maximise the efficiency and safety of LNG transfer. We are currently working with clients, Classification Societies and regulators and industry bodies to integrate the transfer system with bunkering barge and feeder vessel operations to support an LNG-fuelled maritime future. The LNG Floating Transfer Terminal (FTT) has been developed to allow for small to mid-scale LNG operations at significantly lower cost than a traditional jetty based fixed terminal. Importantly, it also has significantly less environmental impact in comparison to a traditional fixed terminal.Designed for communities that have limited appetite for major civil works required for new harbours, quaysides and jetties due to environmental sensitivities and lack of readily available investment. Recognising this, Houlder, power generation experts Wärtsilä and hose supplier Trelleborg have combined their talents for innovation to develop an alternative solution. Visitors to Houlder’s Gastech 2018 stand (F107) will also be able to discuss Houlder’s range of barge and vessel designs to safely and cost effectively store, bunker, process and offload LNG. These include feeder vessels, storage barges and port and harbour bunkering solutions. The event is being held at the Fira Barcelona, Gran Via state-of-the-art exhibition and conference centre from September 17-20. Contact us to arrange a meeting or you can register directly here.